Like any good car event, the real show begins outside of the parking lot. One random Malibu street got packed with some incredible, rare cars that morning. It’s not just your standard exotic driver that comes out, people from all walks of the auto world congregate here. One of the coolest cars there was this Audi 4000 “Nuattro.” It wasn’t flawless by any means but it was certainly perfect. Period correct graphics and bike, plus those BBS wheels and period correct plate? Amazing. ...especially when this was close behind! As a resident Z32 owner, I couldn’t ignore this nicely modified Z32. It looked all stock minus the 99+ JDM front bumper and 99+ rear lights. Now, this was quite a sight. At first glance, it may look like a 991.1 GT3 but a closer look reveals this is actually anon-GT3. 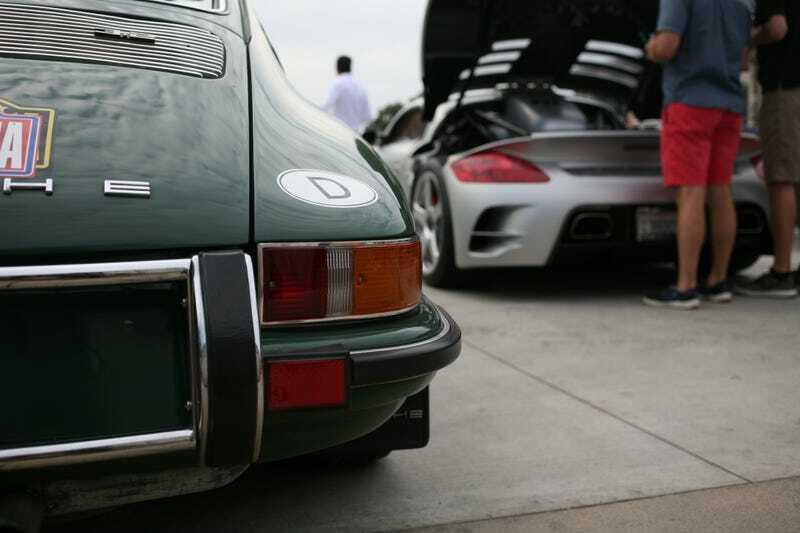 Being that this was a California event, there was no shortage of Porsches. This 993 was sitting pretty on some BBS wheels. I never really liked ducktails on the 991, but I’ll make an exception for the GTS. Given the awful paint quality, I somehow doubted the authenticity of this RWB car. Wetsanding goes a long way. Life was clearly not Ruf for this 964. Clean as a whistle! I was hella psyched to see those Hellas. Check out those tires, this Z3M was clearly putting in work! Ah yes, the famous canyon Prius. Ridiculous in the best way. Having covered the hill, I decided to venture into the actual event. It did not dissapoint. There were no shortageofMontana plates. Quite a lot of farmers have vacation homes in CA, I guess! E24 M6s have become quite a rare sight nowadays, so it’s always a treat to see one as clean as this. One of the real heavy hitters of the show was the Ruf CTR3 (Sporting dealer plates, of course). This car has been all around the US, and I was told it was 1/1 narrowbody CTR3s made. Another special car you certainly won’t see every day, a 993 RS! I have no idea if it was accurate or not, but the odometer read under 500 miles. You can’t have a good show without there being at least 1 F40 there! This particular car is a US spec example. I’d like to close with this Delahaye 135 MS Chapron Vedette (Say that 3 times fast) because in my opinion, it is not just one of the most beautiful cars ever, but one of the most beautiful things. Trancas Cars and Coffee, where you can see art driving.